‘Golden Dawn: A Personal Affair’ director Angélique Kourounis spent years tailing the Greek neo-Nazi political party that hates women and loves violence. She tells Broadly what she learned about Europe’s scariest far-right group. Why has the neo-Nazi far-right party Golden Dawn been winning support in Greece since the start of the 2009 financial crisis? A total of 69 of its members, including MPs, are on trial for running a criminal organisation that intimidates and kills immigrants and its political opponents, but it still went on to win 18 seats in last year’s national elections. Opponents hoped that the tide might turn against them when one of its MPs was charged with assault for slapping a female politician during a TV debate, but they were disappointed. Its surge in popularity did not stop even when party leader Nikolaos Michaloliako said Golden Dawn was “politically responsible” for the murder of anti-fascist rapper Pavlos Fyssas. Obsessed with finding out why so many Greeks support it, Angélique Kourounis spent five years filming Golden Dawners with her colleague Thomas Iacobi. I spoke to Angelique about the hundreds of hours she spent filming Golden Dawn: A Personal Affair and her determination to find out what makes the party tick. Broadly: What did you achieve by devoting so much time to this project? 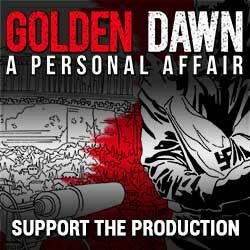 You couldn’t do a film about Golden Dawn in a short space of time because they wouldn’t accept you. They would only show you what they wanted you to see. We filmed on food distribution runs and blood distribution runs, at press meetings, political meetings, meetings of local cells, where people meet twice weekly—some were in wealthy areas in Athens like Alimos and Glyfada—and while they were filming and working on radio and online. What kind of people did you discover are members of Golden Dawn? I met jobless people, rich people, middle class people; this is not a class party, it drags in people in from everywhere. There were three women I met, one of them was leftist, one was socialist, and the other one was conservative and they all decided to join Golden Dawn in 2012 because they had no trust in other parties. To be honest, there was a moment I was in doubt. I was in a meeting and everyone I had spoken to seemed so reasonable. I said to myself: Where is the Golden Dawn I thought I knew, the one that is violent, has killed people? I thought maybe I was wrong. But then a guy who had forgotten that he still had a microphone attached started speaking and gave orders to the members of the local cell about how to behave, and what to tell me when they were interviewed. And then I realised I wasn’t wrong: Golden Dawn is Golden Dawn, the one I knew. I’d say they are Nazis, or the direction is absolutely Nazi—and they are perfect racists and sexists. One man I interviewed said he helped the black people when they were in Africa as military with the UN, but only to make the black people stay there, not to come to his country and change its color. What about sexism in the party? I spent a lot of time with women from Golden Dawn and there are women involved in leadership, but it’s absolutely true to say that men take priority and the top positions are always given to men. Everyone was delighted when [MP and party spokesman] Ilias Kasidiaris slapped [Communist Party member] Lianna Kannelli on TV, they thought she deserved it. Women’s place, from their point of view, is that we just have to go back to the kitchen and open our legs for making children. What was incredible was that the women absolutely agree that women mustn’t work and believe that the state has to provide them a salary to raise their kids. We were always afraid, mostly after the second documentary was aired in June 2014—because if they had seen it, we were done for. Anyway, we had cameras broken and one day I was attacked—it was at the point of being very bad, but Golden Dawn’s deputy Nikos Mihos intervened, saying to them to stop beating me and trying to take my cell phone. Which I think he might now regret. Most of the time we were OK: Thomas, who is German, blond, and good looking, was the good guy, the one Golden Dawn members [were] told they had something in common with. I was the stupid, silly, small, fat girl who they didn’t pay much attention to. At one of their rallies Thomas and the cameraman were sent far away from the action, and I was allowed to be at the front with my small camera phone, a silly girl who was still discovering the world. This way we got the pictures we have. What is their attitude towards the media? At first Golden Dawn was a very presentable party, and Kasidiaris was invited on morning TV and asked about the last movie he had seen, that kind of thing. We knew what this guy was, but if was only after the murder of [antifascist rapper] Pavlos Fyssas that the media started to say Golden Dawn were trouble. It was too much after years and years of silence. I had thought it would be the end for the party, but the result was the exact opposite. That’s probably because Greeks don’t believe the media any more, and Golden Dawn believers don’t trust anything they say. On the other hand, their radio and online operation is very important to them. Whatever they do, they put it immediately on the web to show what they are doing, like Daesh. Golden Dawn blocked the border with Albania for two hours, they shoot it and put it on the web. When they destroy the stalls of the immigrants, they put it on the web. They want to show that they act. And it works. What do you think Golden Dawn’s game plan is now? They are waiting for their time. I think that was the truth that I was looking for when I started filming. The last shot in the movie is a key interviewee who says that once Syriza is in power, Golden Dawn will be next. All the movie was the demonstration of that. What are your fears if Golden Dawn continues to gain support in Greece? To me it’s quite straightforward: My partner in life is a Jew, one of my sons is gay, another is an anarchist, and I’m a left-wing feminist and a daughter of immigrants. If Golden Dawn comes to power, our only problem will be which wagon they will put us on. If people like Golden Dawn are in power the only response would be to stay and fight back, or leave. There is no place for free-thinking people, for people of the left, for gay people, for anti fascist people and this is perfectly shown in the movie. I grew up with stories of war and resistance from my grandmother against the Italians then I had the incredible privilege to meet my partner’s father, Leon, who was a Jew and part of the resistance in France. He explained to me that there was no other choice but resistance. You have to fight and resist, and if you don’t, you accept what’s happening.